Special thanks to Aaron Dickinson for reminding us that we hadn’t released our first quarter pre-foreclosure data. THANKS AARON! 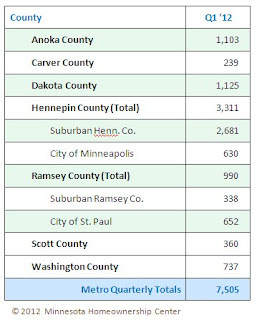 On Thursday, June 7th, the Minnesota Homeownership Center released its data on the aggregate number of Preforeclosure Notices received by foreclosure counselors in the Homeownership Advisors Network for the first quarter of 2012 (January through March). The numbers, while increasing slightly from Q4 2011, show that the number of struggling households in Minnesota continues its downward trend. Wilkin & Clay Counties reported a 40% increase – although small numeric changes in this area can show large variations in the percentage (40 households received a notice in Q1 2011, while 56 households received a notification in Q1 2012). As background, Minnesota state law (MN Statute 580.021) requires that the foreclosing party provide information regarding foreclosure prevention counseling services to the mortgagor (homeowner) and provide the homeowner’s name, address, and most recent known telephone number to an approved foreclosure prevention counseling agency before filing the notice of pendency. 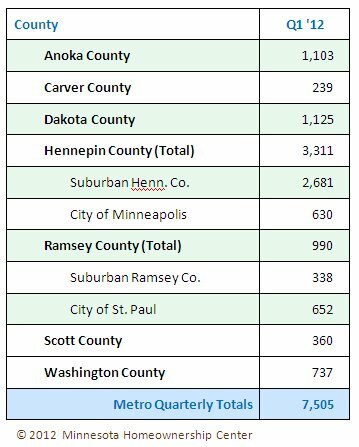 Once the Minnesota Homeownership Center's network of foreclosure counselors receives notification from the lender/servicer/homeowners association, they then contact the homeowner, and track the number of notifications received during the month in their monthly reporting to the Center. Most importantly, if you or someone you know is struggling with their mortgage payment, new programs, resources and assistance are becoming available all the time. Don’t give up… contact a foreclosure counselor that is a member of the Homeownership Advisors Network today to see if there’s help available for you to avoid foreclosure. Even if you’re not yet behind, now is the time to call. 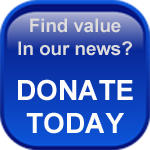 To find your local foreclosure counselor, click here.